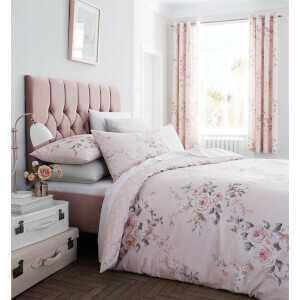 Romantic roses adorn the ‘Canterbury’ bedding set from Catherine Lansfield. The set features a reversible option, a polka dot print, and is crafted from an easy care polycotton fabric offering supreme softness and durability. Dress your bed to make it a pleasing focal point in your bedroom, helping to create a relaxing atmosphere and encourage a good night’s sleep. Includes a matching pillowcase.